This isn’t the first of the water powered gadgets, but it is definitely an attractive new design. Plus besides looking good on your desk, it allows for you to live your life just a little more eco-friendly. You also won’t have to worry about constantly replacing batteries, instead you just refill a tiny capsule and you’re ready to go. 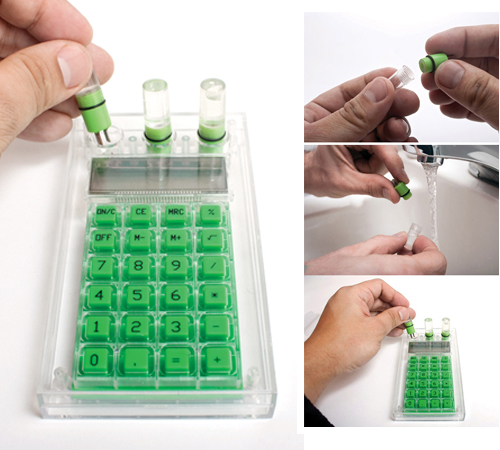 The Hydro Powered Calculator has a total of 3 small capsules that you fill up with water. The body itself is made out of clear plastic, which gives you the geeky joy of being able to see right into the insides of your gadget. Then it has the bright green buttons, sorry, no other colors are available for those of you that are not fans of green. It stands 2 inches tall by 5.25 inches long by 3 inches wide. You can purchase this for $10.99 through Perpetual Kid. Sad that this chemical reaction can’t last forever. Still a very cool novelty item and a talking piece. I’d hate to order replacement alloy metals. I think I’ll stick with solar thanks, seems more eco friendly, even if it’s maybe not the coolest option.